Give yourself permission to create something new in your life today. Risk something new. If we stay in the same pattern or way of living without making change or taking risks we’ll never create new experiences. 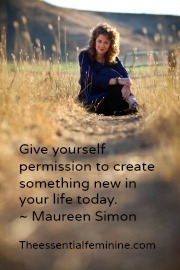 Give yourself permission to create something new in your life today. 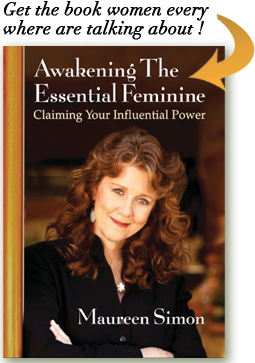 Maureen is founder of The Essential Feminine Company™ (TEF)-a lifestyle and business design company that supports women to create successful powerful lives that incorporates their feminine attributes and gifts. Her company provides learning environments and products that support women in claiming, living and leading with their natural strengths and talents. TEF believes that it is now time for women step forward and makes a major contribution in the world. Private consultations with Maureen Simon are available to support you in designing the life and business you truly desire. Join Maureen on Facebook today!